Sometimes, I need a "me" time away from the stress of life. So, I went to a mall and window shop. 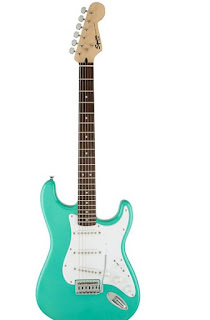 There, I saw a sea foam green electric guitar with the tremolo. It is the Bullet Stratocaster. It is easy, low-cost and yet, practical guitar for the beginners. To tell you, I am fond of electric guitar. In case, you are wondering what on earth is tremolo. It is a quick repetition of one or two notes that moves back and forth with greater intervals. It sounds like a trembling or vibrating effect that makes the crowd thrilled and shout.